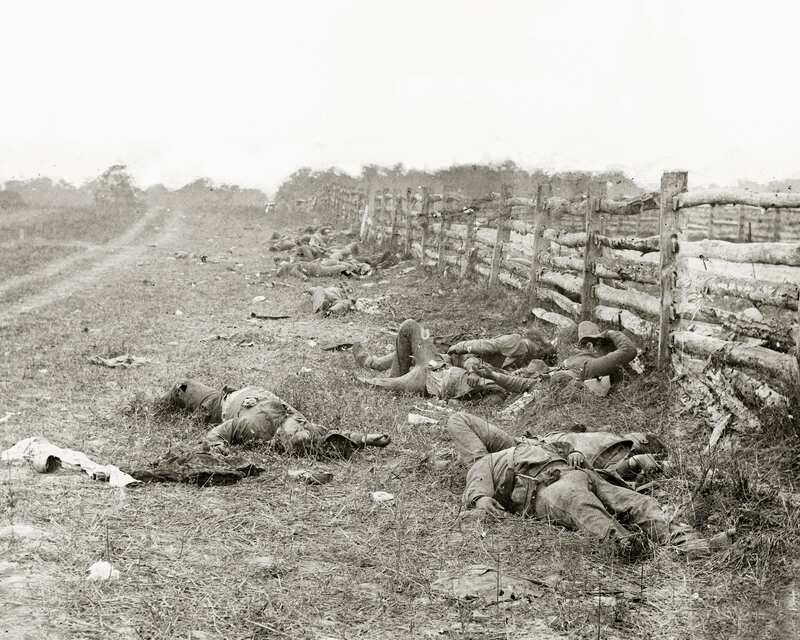 If you grew up south of the Mason Dixon line you probably know it as the Battle of Sharpsburg, but of course the Union won the war and so its official name bears the northern nominative: the Battle of Antietam. In either case, today is the sesquicentennial of the bloodiest single day of fighting in American history—then or since—with more than 23,000 casualties in a twelve hour period, including at least 3,500 deaths. To gain some sense of the magnitude keep in mind that this is almost a third again as many people who died in the 9/11 attacks, but the U.S. population in 1862 was approximately 31 million people, while according to the 2000 census the U.S. population was 281 million strong. 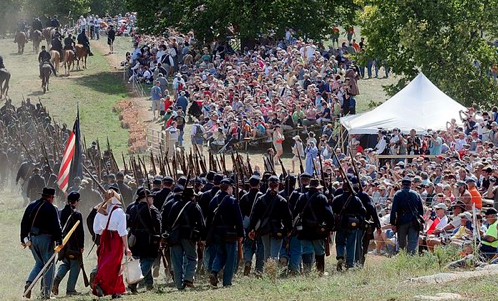 Nearly 4,000 reenactors showed up this weekend to restage the battle—the second of two such events in a two week period—as well as 2,000 spectators per day over a three day period. Reenactors are typically known for their commitment to authenticity, right down to the socks they wear, the number of buttons on their uniforms, the instruments and music they play, the food they eat and the ways they prepare it, the tobacco they smoke and chew, and so on. Indeed, their encampments are a living museum and there is plenty to be learned by attending such festive events. But what we can’t learn, of course, is what it is like to be at war. It is an old bromide that war is unrepresentable, an experience that defies our ability to communicate it to those who have not experienced it in anything but the most trivial of ways. There are those who do the fighting and those who view wars at a distance, a dialectic that has become all the more pronounced in late modern times, and as the photograph above underscores, the boundary between soldier and spectator is discrete and discernible, perhaps one more way in which such reenactments (inadvertently?) reinforce their commitment to authenticity. But the larger point is that however accurate such events might be in some regard, they ultimately reduce to an instance of play acting. The sheer boredom and tedium of waiting for battle is erased by a carefully prescribed schedule of events. Supply shortages are not an issue. There is no disease and dysentery. No bones are crushed, no limbs are blown apart, no bodies are invaded by musket balls. No one stays around the week after such events to recover and bury the rotting corpses left behind. In short, the real war experience is nowhere to be found. And it is little wonder how such events—cast as a family outing—contribute to a romantic understanding of war and the warrior. Such was a prevailing attitude prior to 1862 as well, before the viewing public was introduced to an exhibit at Mathew Brady’s New York City gallery titled “The Dead of Antietam.” The photographs (actually shot by Alexander Gardner who did not receive credit at the time), many of them employing the new stereographic technique that produced something of a three dimensional quality, led the NYT to report that Brady’s exhibit “bring[s] home to us the terrible reality and earnestness of war. If he has not brought bodies and laid them in our door-yards and along streets, he has done something very like it.” For the first time the American public qua public was confronted with a reality of war that could not be captured by the report of daily body counts or the public readings of lists of the names of the war dead. The realist aesthetic of Gardner’s photographs, seventy in all, gave the lie to—or at least seriously challenged—the romance of war and were eventually important resources for Stephan Crane’s The Red Badge of Courage. It would be a tragic mistake simply to turn tables and assume that somehow these photographs tell the “real” story of the Battle of Antietam/Sharpsburg all by themselves. But it would be equally tragic to assume that we could understand the battle without the “terrible reality and earnestness of war” they put on display.